* If you're changing your floors, counters, etc. and you need color advice for those items, you'll need to have already chosen your materials, and only need help to finalize the color – plus you will need to have the samples you're deciding between at our consultation. IF you're unsure about what materials you want, I can help you, but I will do that work under a separate contract. If you're considering painting kitchen or other built-in cabinets/bookshelves, etc., or other freestanding furniture – that is also included in your color consultation, and is completed during your appointment at no extra charge. wow your neighbors with an amazing new color! Appointment cancellations are accepted 10 days before your appointment. If you need to cancel closer to your appointment day, there is a $75 cancellation fee. If you re-book your appointment within six months, your cancellation fee will be subtracted from your color consultation fee. Payment for all interior-only consultations is due at the end of your consultation; for exterior or "whole house" consultations, half is due at your 1st appointment, and balance due at your 2nd appointment. You can pay with cash or check. and deliver your digital color map via email within 2 weeks of having all your photos and information. Each color palette includes any number of exterior colors, including main house color, trim color, front door color and any number of accent colors needed. 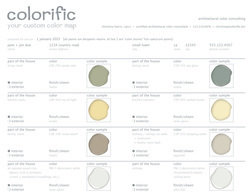 All options come with a digital (pdf) color map of your chosen palette for your painter to use to complete your project. If you live in the States, and you prefer a physical (paper) color map with actual Benjamin Moore color swatches on your map (plus 2" Ben Moore color swatches to keep) – for a $20 additional fee, you can have your physical map mailed to you via USPS Priority Mail. $250/hour (2-hour minimum) - Please contact me for an estimate. Do you need help with finding a couple of items to complete a room? Maybe the perfect rug, a new coffee table, or a fresh way to organize your front hall or mud room. Maybe you need some help to pull together an entire room using a few of the items you already have? If you don't have the time or interest in searching the world and web for that "missing piece" of your home decor (or everything you need to update an entire room) – let me help! We'll start with a questionnaire to zero in on your taste, needs and budget, and then I'll set off to find the things you require. Once I've gathered all my research and picked out the items I feel will work together to complete the room, I'll create a simple pdf "mood board" showing photos of all the pieces together, plus a list of prices, and which stores carry it. In addition, I can provide a look for a room that includes photos and prices of both originals and knock-off versions – and then you can decide what makes the most sense for your home and lifestyle. Think of it as "interior design help" but keep in mind, I won't be designing custom pieces, or ordering/installing anything – I will be creating a mood board based on your input and budget, allowing you to purchase the items on your schedule. If you hate shopping or don't have the time to research – this could be a great fit. The work will be completed under separate contract and billed at $200/hour (2-hour minimum). I will provide an estimate for the cost of my time, and I won't go over the original estimate without your approval.